On Saturday, our family was honored to walk with TransOhio in the 35th Annual Stonewall Columbus Pride Parade. 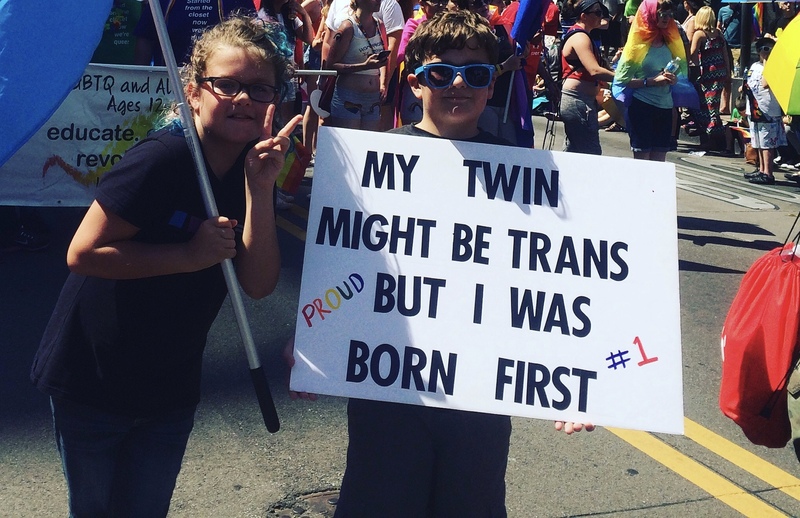 My kids are not quite 11-year-old identical twins and my daughter socially transitioned just before the age of 5. It has been her wish to walk in the Pride parade to celebrate her identity and stand with her community. Saturday was truly a dream come true for her, and as her mom, I couldn't have been more thrilled. What I didn't expect, was the impact it would have on her twin brother, Murphy. People ask me how Conner's transition has been for her brother on a regular basis. At the ripe age of 4.5, he would tell us that Conner was really a girl. When she initially transitioned, he seemed to easily make the switch to using female pronouns. But, as the weeks went by, he began to struggle a bit as the quiet, shy brother became an opinionated, thriving sister who no longer would stand by and play with a truck when she would rather play princess fairies. She no longer looked like him, no longer called herself his brother, and would no longer sit quietly by content to allow him to take the lead. The first year after Conner's transition was hard on Murphy. I would occasionally overhear him trying to barter with her. He'd give her his most prized Transformer, if she would be his brother again. Conner would tell him that she would pretend to be his brother, as long as he still referred to her as "she" and as long as he didn't expect her to put boys clothes on again. Those negotiations never got very far. Of all of us, Murphy was the one who actually needed to grieve the loss of his twin brother. My husband and I didn't feel grief. We were worried for the future and concerned about all the changes, sure. We had been working with healthcare professionals that we trusted, and we knew that we were making the right choices because Conner was blossoming into a happy, confident, well-adjusted little girl when just a few weeks prior she has been quiet, depressed, and anxious. But Murphy struggled. He would cry in my lap and tell me that he loved his sister, but he missed having a brother. One day, while getting ready for kindergarten, he decided to wear one of her dresses to school. I think he was trying so hard to have that connection of being the same gender as his identical twin that he thought a dress would help. Thankfully, the other kids at school were supportive and many kids (both boys and girls) told him how much they liked his dress. But, wearing a dress didn't make him feel any closer to his sibling. Over that first year, we encouraged Murphy to grieve as he needed to. At times, he would be angry, at other times, sad. He talked to a therapist a few times and that seemed to help. We also had very grown-up conversations with both of our children about the need to support one another, yet allowing each other the space to be sad and happy about the changes. But as time went by, and Murphy came to terms with the fact that his sister was going to stay a sister, he slowly became her biggest supporter. Murphy is the one who does a lot of the behind-the-scenes hard work. He's there with her in the playground when kids say mean things. He was the one who went head-to-head with a bully who said that God didn't make mistakes and his sister was going to hell. I found him holding her this year while she lay sobbing in her bed after a bad day at school. When Conner was afraid to change classrooms because she didn't want to hurt her teacher's feelings, it was Murphy's opinion that finally got through to her that it was okay to move into a class with all her allies. He is often the quiet solid wall of support for her while Mom and Dad go in to meet with the teachers and school administrators. While he might only be 14 minutes older than her, she treats him like a big brother and he acts like one. We giggled while we created his poster for the Pride parade. I read to them about the history of the Stonewall Inn and the police raid in 1969. We talked about how the parade is a combination of a celebration, a protest, and a time to come together as a community. We talked about how, as cis participants in the parade, we were there to show support for Conner and a community we love. The parade was not about us, it was about the LGBTQ community. We talked about the recent events in Orlando and how terrible the world can be for a group of people that includes many loved ones, including his sister. But, today, with tears streaming down my face as I write this, I want to thank the people of Columbus who came to the parade on Saturday. There's this special section of the parade route as it comes into the Short North district, where the streets get narrow and the crowd is close. So many of you pressed your bodies into those tight spaces. You pointed to my son's sign, you gave him a thumb's up, you shouted thank you's for his support, you ran up and hugged him, and you loved on him. You made him feel so special. So loved. We were prepared for the support to his sister-which she got in spades and basked in. But, we were shocked at the number of those who came up to my son to thank him, take a picture, and basically drown him in love and support. We came to support you and to support Conner, but were overwhelmed by the support you gave us. I looked down at his face during the height of the parade, and noticed his lip beginning to tremble. I squeezed him close and gave him a smile. Later, he told me how close he was to crying, but he didn't want to cry during such a happy event. Thank you. Thank you for loving both of my children. Thank you for loving our family. I went prepared to pour out my heart for all of you, and I'm completely humbled by how much you poured into us. There are so many moms, and dads, and brothers, and sisters who love you, even if we aren't necessarily related. We went to the parade fully realizing that this celebration wasn't about us. Please forgive a blog post that focuses on how we felt when we went to Pride. I wanted to take the opportunity to thank as many of you as possible for showing us love during a time when we meant to show it to you.